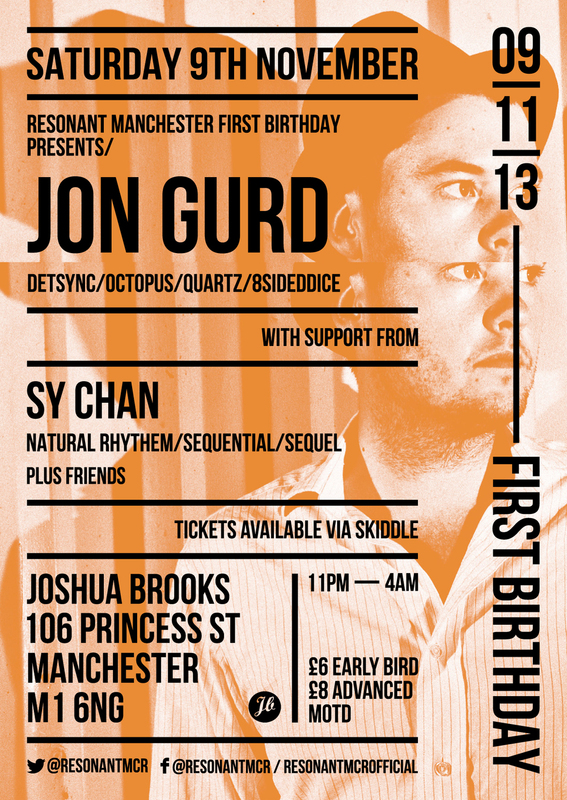 October 2012 saw the launch of Resonant Manchester, With the vision of keeping arms length away from the already saturated market of deep house, and a passion of keeping the House, Tech house and Techno sounds alive and at the forefront of the Manchester music scene. They took this vision to Joshua Brooks, a renowned bar by day, Night fall sees the doors open to its notorious bare brick basement tucked away in the heart of Manchester city centre. Over the years, the basement has become somewhat a landmark of Manchester nightlife. The club and club night have gone hand in hand over the past 12 months and Resonant Manchester have created an already reputable name for themselves which only looks like growing. Already with a more than reputable residents on their books, Sy Chan (Sequential/Sequel) and Rudosa (formerly The Dutch Rudder [BangBang/LoveNotMoney]) in their first year, they have brought a variety of established artists to the confines of the club. ThreeSixty (Maquina Music), Ant Brooks (GreatStuff/1605) Prok & Fitch (Floorplay Music) to name a few. Most notably, The sellout event back in March when the city's clubbers saw Resonant bring the master of house Sebastien Leger to the intimate venue, resulting in a party and atmosphere unrivalled by most. On November 9th, Resonant celebrate their first year with one of the most exciting and innovating techno producers emerging today. Jon Gurd has been gaining a huge reputation in the industry for his in-demand productions, recognised for their raw, energetic and hypnotically rolling properties. He has gathered support from artists including Dubfire, Loco Dice, Adam Beyer, Marco Carola, Ritchie Hawtin and Sian. Jon has also been writing collaborations with innovating techno producer and Drumcode favourite, Alan Fitzpatrick. The pairs first collar was dropped on 8 Sided Dice in May 2012, and achieved a place in the Beatport Top 10 Techno Chart. The second was signed to Paul Ritch's label, Quartz, featuring a remix from Paul himself. The duo are currently writing lots of new material together for what is becoming an exciting studio partnership. With releases planned on Alans ESD vinyl only label and Jon's own Det Sync label. Supporting Jon will be Resonant resident Sy Chan, With years of experience playing alongside, supporting major artists, and representing global brands, Sy expresses the best cultural melting pot between east and west. His asian heritage combined with UK experience surely helped him to be recognised as a name to look out for in the industry. His debut EP 'Inner Minds', on Horatio's Belrin based label Natural Rhythm has gained early support from artists such as Marco Carola, Luciano, Reboot, Paco Osuna, Nima Gorji, Gel Abril, Stacey Pullen, Federico Grazzini, to name a few. With many tracks and remixes lined up for release, including his long awaited 'Bambara' production, scheduled for release in early December on new Manchester label Sequential Records.